“Award-winning restaurateur Ashok Bajaj of Knightsbridge Restaurant Group is pleased to announce the mid-March anticipated opening of his latest venture, SABABA, at 3309 Connecticut Avenue, Washington, DC 20008. 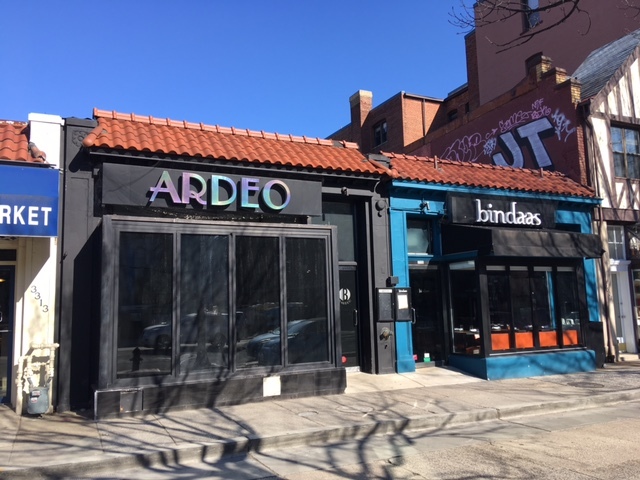 SABABA replaces Cleveland Park’s 20-year landmark restaurant Ardeo+Bardeo, becoming the new neighbor to popular Bindaas, which remains in service during the buildout of the new restaurant. SABABA, which comes from the Hebrew slang, meaning cool and carefree, will offer “modern Israeli” cuisine drawing inspiration from the Middle East, Turkey and Greece. The menu will be comprised of a nice balance of innovative cuisine and traditional fare. A large portion of the menu will be produce-driven. Ryan Moore has been tapped to serve as executive chef for SABABA. A native Washingtonian, Moore graduated from L’Académie de Cuisine in Bethesda, Maryland. His culinary career began in June 2002, working as a sous chef at Zola before being tapped by José Andrés to be part of his team at minibar by José Andrés. Here during his five-year stint, Moore delved into molecular cooking and excelled so well that he was sent to California to assist with the opening and cocktail program for The Bazaar by José Andrés at the SLS Hotel Beverly Hills. During his tenure, minibar was annually nominated for a James Beard award. Then in May 2010, a change of pace took Moore to work at sister restaurant Zaytinya as a sous chef under Mike Isabella. Here he was immersed in the techniques and flavor profiles of Mediterranean fare at this very popular restaurant. Rogue 24 would be Moore’s next career move in April 2011. RJ Cooper and Moore developed the menu for a popup in New York City that lead to the opening of Rogue 24. Moore was put in charge of Rogue Sessions. He developed 12 new courses each week to marry well with 12 dishes prepared by the visiting celebrity guest chefs. The series was successfully and demanding so when Rogue 24 shuttered, Moore took a break from the kitchen to work on the island of Dominica. Here he delved into growing spices and tried his hand at organic gardening. Next Ris Lacoste of Ris offered him the opportunity to serve as the chef de cuisine for two years. Moore assisted with the opening at Union Market, as well as her catering division. Then in July 2016, internationally renowned chef Yannick Cam asked Moore to join him in the kitchen at Bistro Provence. Once again Moore appreciated the learning curve one experiences working under a master chef, who shares a similar passion for cooking and working on the line. Moore worked for one year before he was tapped by Ashok Bajaj in October 2017 to ask him to join his company for a new concept he was developing to replace the 20-year old, successful neighborhood restaurant, Ardeo+Bardeo. The two collaborated on the opening menu for SABABA. At this new concept, guests can anticipate salads, hummus, mezze, kebabs and platters for the table, with an abundance of vegetarian options as well as chicken, lamb, and fish dishes. Menu items are priced from $8 to $26. A small sampling from Executive Chef Ryan Moore’s opening menu will include dishes such as Carrot Salad with dates and mint; Beetroot Relish with tahini and pistachio; Charred Eggplant with herbed labneh, pomegranate and pistachio; Dorade Crudo with choban salad, chili, cucumber, tomato and lemon; Harissa-Marinated Chicken Thighs; Lamb Shank with braised red cabbage, dates and citrus; Grilled Sardine with feta, walnut and charred zucchini; Kushari, chickpea with rice, lentil, pasta, fried onion and spiced tomato sauce, as well as Vegetable Tagine with charred okra, herbed couscous and tomato. For libations, one will find an international wine list with an emphasis on Mediterranean varietals that pair well with the restaurants “modern Israeli” cuisine. 60 wines will be available by the bottle and eight wines by the glass. Prices range from $38 to $75 by the bottle and from $10 to $15 by the glass. Four signature cocktails and two mocktails reflecting the spirits and spices of Israel will also be available. Priced at $12 each, cocktails include the Zephyr Breeze with Cotton & Reed rum, pomegranate soda, rosehip, and sumac; Gardens of Haifa with Montelobos mezcal, sundred tomato, red pepper, garlic, parsley and thyme; Cradle of Civilization with rye-infused Filibuster whiskey, Sorghum molasses, oak bitters and caraway-sesame cookie; Phoenician Frappe with Green Hat gin, Etrog liqueur, arak, mint, lavender and soda, as well as Halvia World Away with Casamigos Añejo, carrot, pistachio oregeat, cardamom and apricot. Ashok Bajaj has tapped Martin Vahtra of Projects Design Associates of New York, a James Beard Foundation’s award-nominated restaurant designer to create the space for SABABA. A bay window, situated to the left of the entrance, will be transformed into a small lounge area complete with a bench, throw pillows and ottomans. The walls and ceiling will be draped with bedrolls to create a tent-like feel while the 12-seat bar will be decorated with a new wood slats and a ceiling that mimics a grape arbor complete with string lights crisscrossing overhead. Antique floor tile complete with Middle Eastern graphic design will be used on the lounge and bar areas. The 90-seat main dining room will offer new furniture and backlit Middle Eastern screens will cover the walls. White canvas will hang from the ceiling to mimic sails while lanterns will hang intermittently with the fabric giving the illusion of a Casbah Tent. In many Middle Eastern countries, blue represents safety and protection. It is symbolic of heaven, spirituality, and immortality and will be prevalent in the new restaurant’s color scheme along with other jewel tones. Guests can also book a table in the upstairs dining room, which can accommodate up to 40 guests seated. Those who wish to dine upstairs will be able to select dishes from SABABA or from neighboring Bindaas.